Virgin Media coming to Thanet? Re: Virgin Media coming to Thanet? Of course not. We have a wide-ranging menagerie . . . penguins, frogs, sheep, eagles, dogs and overseeing them all, felis catus domestica. Well the first permits for trench work are showing, scheduled for June & July. All the phone symbols are for VM road works, and there's one on Hartsdown Road as well where the roadworks symbol is. Appreciate it won't be much compared to the massive investment Openreach have made in next generation access in your and most other areas but VM's teams will do their best. A senior BT guy made a remark that they were investing while others are hiding. Ever since I heard that it's made me a little passive aggressive. BT are absolutely spending the bare minimum. Indeed they should be used as a case study on how to fool people into thinking you're spending a bunch of money on superfast and ultrafast networks when you're barely spending more than you had budgeted for pure copper. Add that to the dodgy VDSL I have at the moment, the over a year scrap I had to get it, and that VM don't even sell services with the speed of my two lines combined anymore and I'm a little... bitter. Has this thread turned into a therapy session for Ignitionnet? If I were to add my 2p, it would be that I don't like the fact that other providers didn't take up the chance to start a major rollout of fibre sooner. The news reports of Sky, Talktalk etc. all moaning over the years but none of them actually taking the initiative to join forces with a major provider and build there own networks (and this included Virgin Media prior to Project Lightning). Anyway, I'm waiting for some additional info regarding the Thanet works . Local virgin activity near me. Certainly lots of work booked. Good to see some serious investment in UK broadband infrastructure. Just a wee question how many people need to register an interest to bring VM to your area ? when looking at the TBB map VM seems to concentrate their roll out in built up areas see map uploaded with purple being Virgin Media active. That's no surprise, NS ......... they're running it as a profit-making business. Newt unlike BT their deployment is based on profitability rather than political leaning and subsidies, thats why. So are small village with 1400 residents will be totally ignored by Virgin Media because it ain't commercial profitable. VM aren't BT. Whether there are 1,400 or 14,000 residents in a place if they have fibre running through it it'll have the same kind of viability. Most companies have to dig ducts passing each home to deliver broadband services and population density is more important. 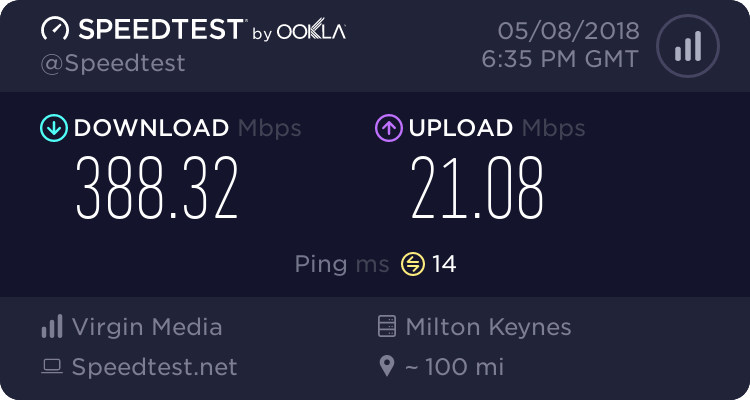 Villages can be among the cheapest places to deploy new network and only become a problem either when long fibre runs are required to reach them, or using a legacy FTTC solution. Holywood's network would've probably been built by one of VM's predecessors that may or may not have had the franchise for Bangor. The build in Bangor is in progress and has been since at least January.